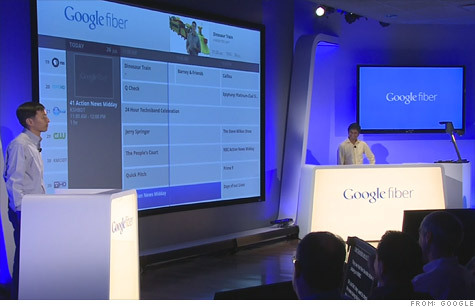 Google representatives explain how Google Fiber TV works during its announcment in Kansas City, Kansas. NEW YORK (CNNMoney) -- Forget what Dorothy said about not being in a certain state anymore. It looks like Google is in Kansas. And Missouri too. Google (GOOG, Fortune 500) launched its long-awaited Google Fiber, the search giant's ultra high-speed network, Thursday in Kansas City, Kansas while also making a surprise announcement: the introduction of Google Fiber TV. The two services will be available to Kansas City, Kansas, which was chosen last year after more than 1,100 cities applied to get the faster Internet. But because the company was a little "ahead of schedule," Google also announced that the service will be available to some in Kansas City, Missouri as well. The Fiber network offers speeds of up to 1 gigabit per second. That's 100 times faster than what the average American Internet user currently has. The company says the average speeds for downloads are 5.8 megabits per second. The event also included a demonstration of Google Fiber TV. The system will allow households to watch all their shows in HD, record up to eight shows at once, store 500 hours of HD video on the cloud and even control multiple televisions through the search giant's new tablet, the Nexus 7. The demonstration, which streamed on Google-owned YouTube, showed how a typical consumer could watch live TV, tens of thousands of shows on demand, pull videos from Netflix (NFLX) (if they're subscribers), search for content using just their voice and watch them across several platforms, including smartphones and PCs. "You don't have to settle for old-style television anymore," said Milo Medin, vice president of Google Access. "It's not just Internet and it's not just TV. It's Google Fiber." Google is offering the TV and Internet service for $120 a month for Kansas City residents, said Kevin Lo, general manager of Google Access. For those who just want the faster Web service, that'll cost about $70 a month. Depending on the length of the contract, subscribers can also get an initial $300 set up fee waived. The search giant plans to provide the service free to schools, community centers, government buildings and libraries. The company also announced that it will encourage users over the next six weeks to rally their neighbors to sign up for the service. This will determine which "Fiberhoods" (Google broke up neighborhoods into groups of about 800 people) will get access to the service first. The higher the interest, the sooner the availability. "Together we will make Kansas City a place where bandwidth flows like water," Medin said. We're "looking forward to writing the next chapter of the Internet together, right here in Kansas City."